The Book Garden: A Writer's Life - Who are you calling a weakling? It's one of those things writers are seldom aware of. Over-usage of certain terms and expressions and words. We might not always notice, then again that's what the editor is there for - to grab us by the collar shoving our little puppy-writer-noses right into the ... well, you get the general idea. And we should listen to what they tell us when they throw an edited-to-death-manuscript back at us. Now that pictures makes me smile! Why? Because my editor once forced my attention to my habit of starting sentences with "And". Funny how I never realized just how often I actually did that!? These days I still indulge in my little let's-put-an-AND-in-front-of-the-whole-sentence habit, but I do so sparingly (I hope) and only have field days with it here on my blog. After all, old habits die hard. Ha. Getting carried away in the throws of creative passion is one thing, but there is no excuse for morphing into a prosaic lover ... errr, writer. You wouldn't want to be called an authorial weakling, would you? Thought so. The strongest plot idea can't fully blossom if it's drenched in weak writing. Apart from the obvious bad habit of using "And" as the first word in a sentence there are quite a few words and phrases which you should use rather sparingly. To many writers this won't be news (though we admittedly often forget it along the way), but some words weaken our writing as they are too vague, telling something rather than showing it. Especially verbs that describe generic action can be replaced by a vast number of more descriptive verbs. Being a strong writer means that your stories will be strong too. And *oops* strong verbs lift up your writing, making it better and more appealing to the reader. Of course that's not the end of it. Not even close. 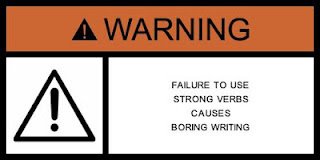 You need to watch out for over-used words, should refrain from sprucing up your text with cliches, avoid vague and abstract words, and keep an eye on consistency in spelling. Not writing sentences that extend over a full page is a pretty good idea too. If you think this is quite a task, well, welcome to the wonderful world of writing! Now how to go on about it? An editor is helpful, no doubt about it. An army of proofreaders at your service won't hurt either. If you want to get it over with fast and easy I recommend you check out Pro Writing Aid or any other of similar websites out there. Though, if you ask me, a human doing the merciless dismantling of your text is to be preferred. My fellow writers - have you ever fallen victim to "weak writing" while smooching your muse? Do you know about your personal weak spots when it comes to diction? How do you go on about avoiding all those textual pitfalls mentioned above? My dear readers - how often were you disappointed when faced with a great plot idea presented in a weak ... all right, word repetition is a bad thing, so let's call it bland writing style?